The advent of online tools and software has made it easy for people to hack Snapchat, WhatsApp, Facebook, and other social media profiles. Snapchat is one of the most popular social media platforms on a global scale. With nearly a billion users around the world, the popularity of Snapchat rivals that of Facebook and Snapchat. Recently, Snapchat lost its uniqueness of providing a disappearing story/status update when Facebook, WhatsApp as well as Instagram, blatantly copied it. However, Snapchat still stays quite popular amongst the youth due to its large collection of funny filters and intuitive user interface. In fact, a few youngsters prefer using Snapchat as their daily driver for one-to-one communication. I will show you a few methods to hack Snapchat account if you are one such avid Snapchat user. But this post on How to hack a Snapchat account should be used ethically, suppose if you or your friend forgot Snapchat username, password and linked mail ID, you can follow any of these methods to try hacking ethically, here I’ve used 3 tools to Hack Snapchat – Snapbreaker.com, Snaphacker.co, Spyzie.com! Here, I will show you a few popular methods to hack someone’s Snapchat account. 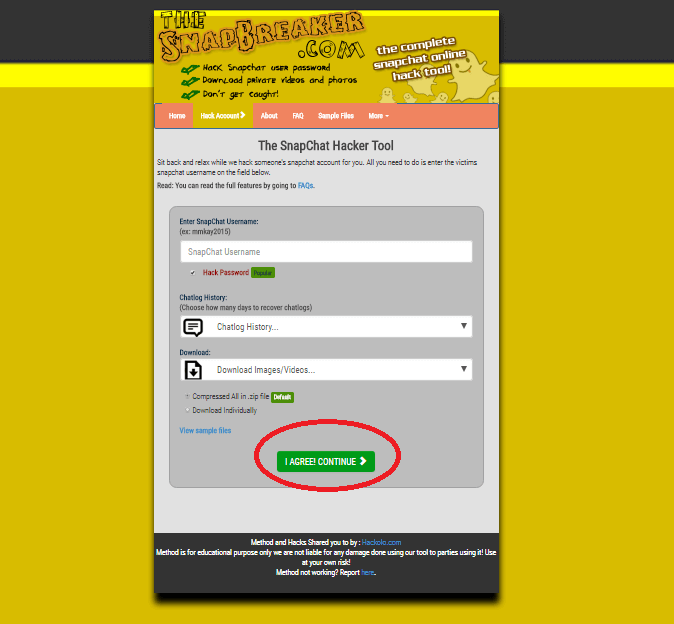 Snaphacker is one of the simplest online tools that you can use to hack a Snapchat account. To hack someone’s Snapchat account, all you need to do is go to the website snaphacker.co and enter the Snapchat username of the person whose account you wish to hack. Once you have entered the username, you can click the Start Hack button to start the hacking process. The process might take a few minutes for completion. However, in case it takes very long, you might want to refresh your page and enter the username again to start the process all over. The best part about using the services of Snaphacker.co is that it is a web-based service and does not ask you to download any particular application to activate it. Also, the service is completely free of cost and covers your tracks well. You do not need a personal Snapchat account in order to start the hack in the first place. Therefore, you are not risking any personal account details on this platform. Snapbreaker.com is another one of the online tools that help you hack someone’s Snapchat account quickly. You can follow these steps to use the tool. Go to the website, snapbreaker.com using an active browser on your smartphone, laptop or desktop. This method does not ask you to install the Snapchat application on your device to start the hack process. 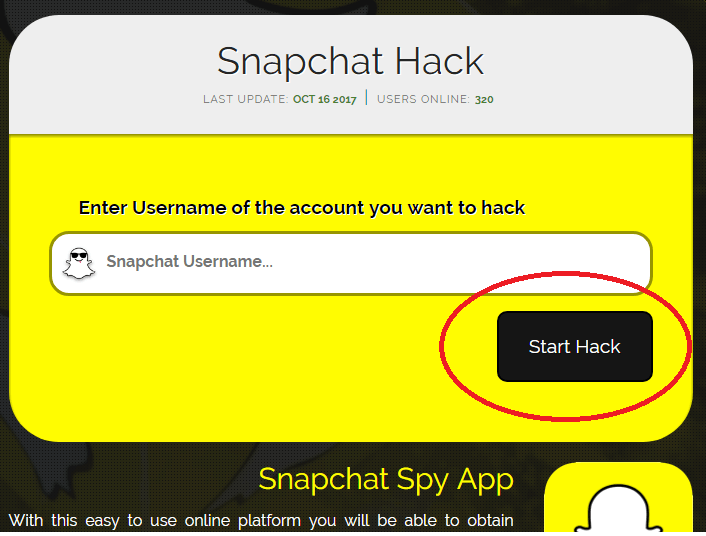 Now, you need to enter the Snapchat username of the account that you wish to hack using the tool. Once you enter the username, you will see a small checkbox with a tick on it saying Hack password. In case you do not wish to hack the password of the account, you can uncheck this box. You can also hack the chat history of the account directly from this tool. To do this, select the period for which you wish to retrieve the chat logs. You will see a drop-down menu under the heading Chatlog History to start the hacking process. You also have the option to download the images/videos of the Snapchat account’s chat. Once you have selected the required fields correctly, you can click on the button I AGREE! CONTINUE to start the hacking process. The process can take several minutes to complete. You need to wait for the process to complete before you access the hacked files. In case the process takes too long, you can refresh and restart the process. 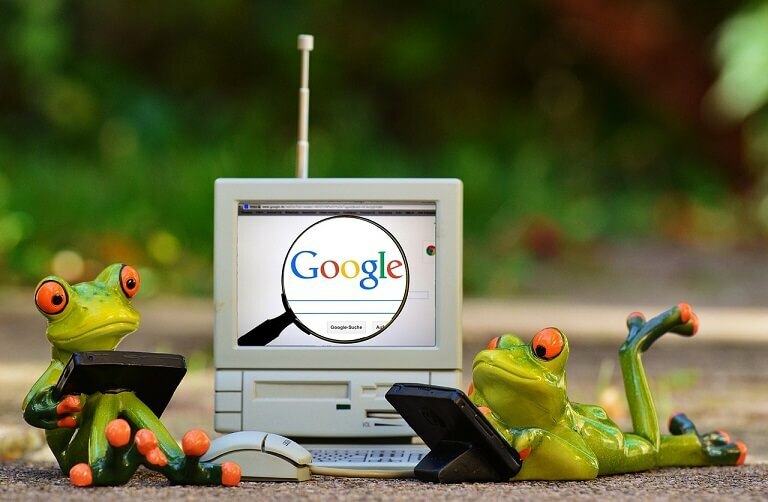 Some users have reported a problem with the tool stating that it does not work with browsers on a computer. Under such circumstances try accessing the tool on a mobile browser. You might face a verification step that asks you to confirm if you are human with a simple task. Complete this task to access the hacked files. You can use the Spyzie online tool to hack the Snapchat account too. Follow these steps to start using the tool. 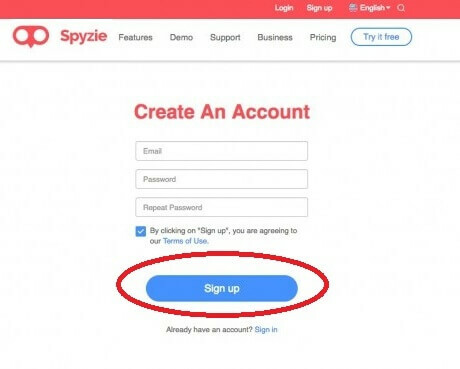 Firstly, you need to sign-in or make a new account on Spyzie by visiting this https://www.spyzie.com/snapchat/ . You need to provide a few basic personal details to finish the registration process. You also have the option to go for the premium account version during the registration process by paying a small fee. Now, you need to provide a few details about the account that you wish to hack using this tool. Spyzie asks for details like Name of the target device’s owner, the age of the device’s owner, as well as OS on the target device. Note: To make sure that the entire process goes unhindered, you need to access the link from the mobile browser of the person whose account you wish to hack. Once you have finished the steps mentioned above, you can download the Spyzie application on your victim’s phone using the link on the webpage. After downloading an installing the application, you can see it listed in the application drawer on your device. You will find a comprehensive step-by-step guide on the application interface that will guide you through the rest of the process to set it up. To make sure that the application works fine without the victim knowing about it, you can hide the icon using App lock. Now, you can track all the Snapchat activity of the person using the browser window and your Spyzie log in credentials. The only thing to note down here is that you need to have access to your victim’s phone for at least 15 minutes for the process to start working. Now that you know the various ways in which you can hack someone’s Snapchat account, we need to make sure that these methods are not used against you. Snapchat developers have employed a good level of encryption to prevent hackers from getting into the system remotely. However, there are several ways in which a friend can get into your account if he/she has the access to your device for a few minutes. You can follow these steps to make sure that you stay on the safe side. This is a no-brainer. Using a simple screen lock is the best way to ensure that the Snapchat account and other files in your phone are safe. All modern-day smartphones allow you to lock your phone with a pin, password or a pattern combination protection. If you own a high-end device, it is possible that you can lock your phone with a fingerprint or retina authentication. Addition of one layer of security is usually enough. However, if you are not satisfied with it, you can lock individual applications using third-party applications like App Lock. Some phones have an inbuilt feature that allows you to lock the individual applications under fingerprint or retina lock. Some applications like the App Lock allow you to hide the applications from your menu. You can use the features of this application to hide the Snapchat application from your phone’s menu. This way the hacker will not be able to locate the application on your phone in the first place to hack it. In case you are not very concerned about the chats on Snapchat and want to safeguard your media files instead, you can hide them from your gallery using the App lock application. You can also transfer all the media into a folder with the name .hidden folder in your phone’s file manager to hide the pictures. It is advisable that you keep revisiting the security page on your Snapchat account on a periodic basis. It is a good idea to keep the status, profile picture as well as last seen hidden visible only to your contacts. This way, no one except your trustworthy contacts can figure out when you last used the account. It is advisable not to add people whom you do not know to your Snapchat as friends. After the last update, Snapchat allows your friends to track your location using this application. To make sure that your kids are safe from dangerous people, always advise them to add only people whom they know to the account as friends. Our day to day lives revolves around the use of Snapchat, WhatsApp,and other social media accounts. By following the right steps, we can take precautionary measures to keep our private life safe from the eyes of potential hackers. Try not to reveal any sensitive information using these social media platforms to stay away from kidnappers and hackers. How to Delete a Snapchat account, please help me. I don’t want to use this anymore. Please follow the above steps to Delete your Snapchat account. How to Hack Snapchat account, please help me I want to Hack someones Snapchat account. Please follow this post, this clearly helps you with How to Hack Snapchat.